it pushes wild anti-Muslim conspiracy theories, denigrates American Muslims and deliberately conflates mainstream and radical Islam. While we find many of the views and actions of Congresswoman Ilhan Omar to be reprehensible, the display in the Capitol rotunda would have never been approved or endorsed by our National Office. Any publications claiming or implying that this was in fact an ACT For America approved and endorsed event is expected to issue an immediate retraction. ACT For America will pursue legal action against any publications claiming otherwise and misrepresenting the facts. How could Republicans and their leadership not notice? It wasn’t like the poster was hidden in the back corner where no one would see it. 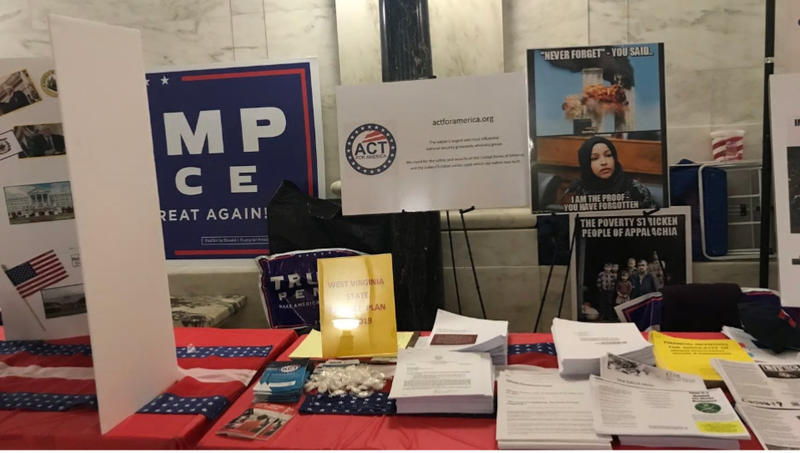 Reading a number of press reports, I’m left with the feeling that Republicans knew what was on display but didn’t react until the Democrats and others reacted and then they were “shocked, shocked, that racism was on display at the Capitol rotunda.” In the picture, note that the only item larger than the poster is a Trump Pence sign. And yet, no Republican noticed the racist poster?